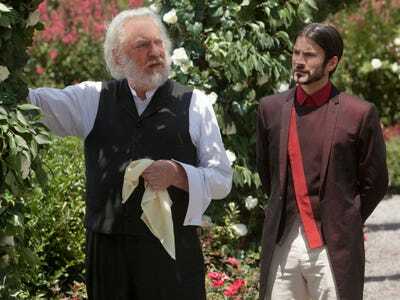 Lionsgate / The Hunger GamesDonald Sutherland, left, with Wes Bentley, inspired his larger role in ‘The Hunger Games’ after writing a three-page letter to director Gary Ross. “The Hunger Games: Mockingjay — Part I” is in theatres this Friday. Lionsgate’s successful franchise based on the best-selling dystopian book series pits Katniss Everdeen (Jennifer Lawrence) against President Coriolanus Snow (Donald Sutherland). However, we could have had very a different movie. Ahead of the sequel’s release, Sutherland told GQ he was never offered the role of the film’s callous, collected president. Instead, he received the part after reading the series and writing an impassioned three-page letter to director Gary Ross about the character. Nobody asked me to do it. I wasn’t offered it. I like to read scripts, and it captured my passion. I wrote them a letter. The role of the president had maybe a line in the script. Maybe two. Didn’t make any difference. I thought it was an incredibly important film, and I wanted to be a part of it. I thought it could wake up an electorate that had been dormant since the ’70s. I hadn’t read the books. To be truthful, I was unaware of them. But they showed my letter to the director, Gary Ross, and he thought it’d be a good idea if I did it. He wrote those wonderfully poetic scenes in the rose garden, and they formed the mind and wit of Coriolanus Snow. It included a discussion on power, Ted Bundy, and the elements of Snow that Sutherland saw as most vital to the film. Because the novel is written from Katniss’ first-person view, there isn’t an opportunity to see anything from the perspective of Snow or his home, the Capitol. Sutherland pointed out the film offered such an opportunity, and Ross agreed. Ross’ response to the letter inspired three scenes of Snow in his rose gardens during the games. Power. That’s what this is about? Yes? Power and the forces that are manipulated by the powerful men and bureaucracies trying to maintain control and possession of that power? Power perpetrates war and oppression to maintain itself until it finally topples over with the bureaucratic weight of itself and sinks into the pages of history (except in Texas), leaving lessons that need to be learned unlearned. Power corrupts, and, in many cases, absolute power makes you really horny. Clinton, Chirac, Mao, Mitterrand. Not so, I think, with Coriolanus Snow. His obsession, his passion, is his rose garden. There’s a rose named Sterling Silver that’s lilac in colour with the most extraordinarily powerful fragrance — incredibly beautiful — I loved it in the seventies when it first appeared. They have made a lot of off shoots of it since then. I didn’t want to write to you until I’d read the trilogy and now I have so: roses are of great importance. And Coriolanus’s eyes. And his smile. Those three elements are vibrant and vital in Snow. Everything else is, by and large, perfectly still and ruthlessly contained. What delight she [Katniss] gives him. He knows her so perfectly. Nothing, absolutely nothing, surprises him. He sees and understands everything. He was, quite probably, a brilliant man who’s succumbed to the siren song of power. How will you dramatize the interior narrative running in Katniss’s head that describes and consistently updates her relationship with the President who is ubiquitous in her mind? With omniscient calm he knows her perfectly. She knows he does and she knows that he will go to any necessary end to maintain his power because she knows that he believes that she’s a real threat to his fragile hold on his control of that power. She’s more dangerous than Joan of Arc. Her interior dialogue/monologue defines Snow. It’s that old theatrical turnip: you can’t ‘play’ a king, you need everybody else on stage saying to each other, and therefore to the audience, stuff like “There goes the King, isn’t he a piece of work, how evil, how lovely, how benevolent, how cruel, how brilliant he is!” The idea of him, the definition of him, the audience’s perception of him, is primarily instilled by the observations of others and once that idea is set, the audience’s view of the character is pretty much unyielding. And in Snow’s case, that definition, of course, comes from Katniss. Evil looks like our understanding of the history of the men we’re looking at. It’s not what we see: it’s what we’ve been led to believe. Simple as that. Look at the face of Ted Bundy before you knew what he did and after you knew. 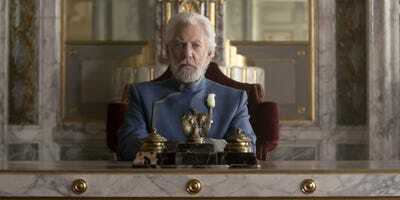 Snow doesn’t look evil to the people in Panem’s Capitol. Bundy didn’t look evil to those girls. My wife and I were driving through Colorado when he escaped from jail there. The car radio’s warning was constant. ‘Don’t pick up any young men. The escapee looks like the nicest young man imaginable’. Snow’s evil shows up in the form of the complacently confident threat that’s ever present in his eyes. His resolute stillness. Have you seen a film I did years ago? ‘The Eye of the Needle’. That fellow had some of what I’m looking for. The woman who lived up the street from us in Brentwood came over to ask my wife a question when my wife was dropping the kids off at school. This woman and her husband had seen that movie the night before and what she wanted to know was how my wife could live with anyone who could play such an evil man. It made for an amusing dinner or two but part of my wife’s still wondering. I’d love to speak with you whenever you have a chance so I can be on the same page with you. They all end up the same way. Welcome to Florida, have a nice day!